Spectra Light UV | Quality of Life Products | KEMF Inc.
BID GOODBYE TO CHEMICALS IN YOUR POOL WATER! WITH SPECTRALIGHT™ ULTRAVIOLET, PROUDLY CHOOSE HEALTH AND THE ENVIRONMENT! SpectraLight™ Ultraviolet is truly a revolutionary water treatment system of higher quality. If you want easier maintenance of your pool or spa, safe pool water without chemicals and with much less chlorine, try SpectraLight™ Ultraviolet. 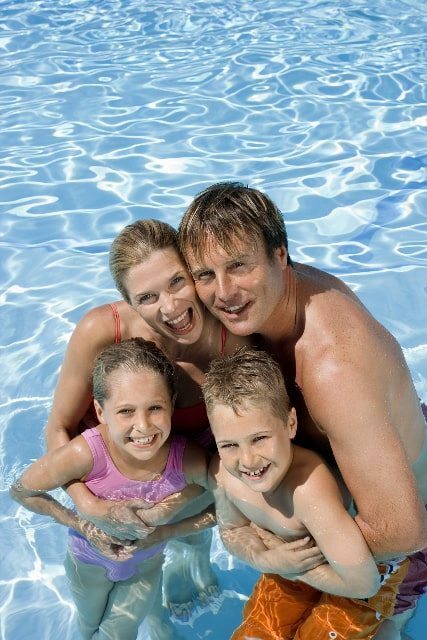 Together, we can make your pool a safer place for your family, and also help preserve our environment at the same time. No more chlorine, bacteria and algae in your pool water! SpectraLight™ Ultraviolet is a revolutionary water treatment system for easy maintenance of your swimming pool. Make summer life simpler with this easy, eco-friendly pool filter from KEMF Life Simplified, Inc. When it comes to chlorine in your pool, LESS is MORE. With SpectraLight™ Ultraviolet, instead of chlorine doing all the work, the UV light destroys 99% of the organic matter in the pool. As a result, chlorine levels can be lowered from 4.0 ppm to 0.5 ppm. SpectraLight™ Ultraviolet produces a high-intensity UV-C germicidal light ray that filters pool water and targets the DNA and RNA of microorganisms, many of which were previously untouchable. It destroys bacteria, viruses, protozoan cysts, giardia, algae, parasites and spores instantly without dangerous by-products in your water. Energy efficient and automatic, SpectraLight™ uses the power of a regular light bulb and requires very little maintenance. Just set it and forget it! 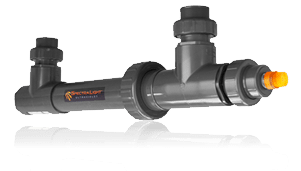 Easily installed between the existing filter and water supply line, SpectraLight™’s UV sterilizers eliminate the maintenance hassles of pool filters while minimizing carcinogenic chemicals. You’ll swim in the same chlorine levels found in drinking water (up to 90% less chlorine). We have known for many years that the chemicals found in pool water can cause burning eyes, skin irritation, difficulty breathing and damage to dental enamel. We also know that using chlorinated swimming pools increases bladder cancer risk by 57% (Centre for Research in Environmental Epidemiology). Moreover, children with the highest pool attendance are five times more likely to suffer from allergies and asthma than other children who were never exposed to these pools. The impact of these chemicals on our children is five times more significant than being exposed to second-hand smoke (Catholic University of Louvain). SpectraLight™ Ultraviolet is 100% safe for your in-ground or above ground pool. UV light cannot pass through the graphite housing. There is no risk of UV overdose, and UV is approved by the EPA for the disinfection of drinking water. You’ll also save on your annual costs for pool filter maintenance because SpectraLight™ eliminates the need to purchase expensive specialty pool chemicals. With fewer chemicals to manage, the water pH balance will be easily attainable. Many SpectraLight™ Ultraviolet users report saving over $400 per year on pool chemicals. And, with high pool water quality, pumps, filters, pool heaters and pool surfaces will all last longer. SpectraLight™ Ultraviolet is the easy, healthy, eco-friendly pool filter and water treatment system. Contact KEMF Life Simplified, Inc. for a free estimate. SpectraLight™ Ultraviolet: a healthier and more environmentally friendly water treatment system. By harnessing the raw power of ultraviolet light, UV technology enables water treatment that dramatically lowers the need for chlorine and eliminates chlorine by-products for cleaner, safer and easier maintenance of your pool or spa. UV has been installed on thousands of pools in Montreal and throughout the province of Quebec. In fact, it has become the “gold standard” at major aquatic centers around the world including the pools at the Beijing Olympic Games. We have known for many years that the chemicals found in pool water can cause burning eyes, skin irritation, difficulty breathing and damage to dental enamel. We also know that using chlorinated swimming pools increases bladder cancer risk by 57% (Centre for Research in Environmental Epidemiology). Moreover, children with the highest pool attendance are 5 times more likely to suffer from allergies and asthma than other children who were never exposed to these pools. The impact of these chemicals on our children is 5 times more significant than being exposed to second hand smoke (Catholic University of Louvain). SpectraLight™ Ultraviolet is 100% safe for your pool. UV light cannot pass through the graphite housing. There is no risk of UV overdose and no toxic by-products are in the water. UV is approved by the EPA for the disinfection of drinking water. UV is the delightfully green sterilizer for the water in your pool or spa, a tool that uses the power of ultra violet light. This NON CHEMICAL environmentally friendly technology is the biggest breakthrough in the pool maintenance industry in over 30 years. SpectraLight™ Ultraviolet sterilizers are easily connected between your existing filter and the water line returning to the pool. Installation is quick and easy for both new pools as well as existing pools. It uses the power of a regular light bulb and requires very little maintenance. Just set it, forget it, and sleep secure! With SpectraLight™ Ultraviolet, not only are you choosing clean and safe water in your pool, but you are making significant savings with regards to pricier chemicals products! Pool Water chemistry is trapped in a vicious cycle with traditional chemical sanitation for swimming pools. SpectraLight™ water treatment system breaks this cycle once and for all. Many SpectraLight™ Ultraviolet users report saving over $400 per year in pool chemical savings! These significant savings added up over time more than justify the value of the SpectraLight™ Ultraviolet water pool treatment system. And with high pool water quality, pumps, filters, pool heaters and pool surfaces will all last longer. SpectraLight™ Ultraviolet water treatment system also eliminates the need to purchase expensive specialty pool chemicals like algaecide. With fewer chemicals to disrupt the chemistry of your pool water, the water pH balance will be easily attainable. And we haven’t even mentioned the time savings! Over the years, how much time have we all spent fighting the battle with algae and cloudy water? Treat your aboveground pool with the pool maintenance it and you deserve. It is affordable, effective and offers you and your family more time to enjoy swimming in your pool as against cleaning it. Think of all the time gained in simply not having to prepare the pool for the next afternoon swim. SpectraLight™ Ultraviolet is one friend you have to have at your next pool party!